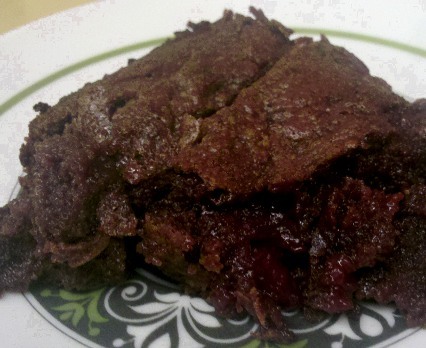 I really liked these brownies, although I preferred them refrigerated than warm. When they were warm, I found that there wasn't really a lot of distinction between the flavors, and nothing really stood out. In fact, I wished I had used a darker chocolate. Cold, I felt like I could taste both the raspberry and the chocolate individually. The raspberry lambic brings a flavor to these brownies that are reminiscent of raspberry extract, but more authentically raspberry. It really brings a lot of flavor. Top that off with burst of fresh raspberries, and this is a winning brownie. The only thing I'd think about changing for next time would be to reduce the amount of sugar by about 1/4 cup. Bring lambic to a boil on high and reduce heat to medium. Continue to heat until the lambic has been reduced by about 1/3. I eyeballed the reduction in this step. The color becomes a very rich red and you should be able to see that the mixture is slightly thicker with a stirring utensil. Set aside. I followed in Kiersten's lazy footsteps and microwaved my chocolate and butter for 30 second increments until both were melted. This only took me 2 30 seconds passes. Whisk sugar, eggs, salt, and vanilla until combined. 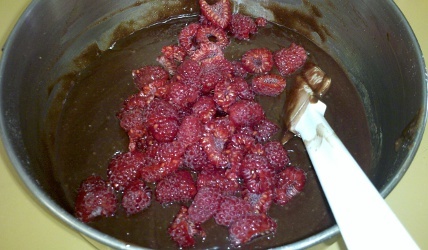 Add the chocolate in several batches (I did it in 4). 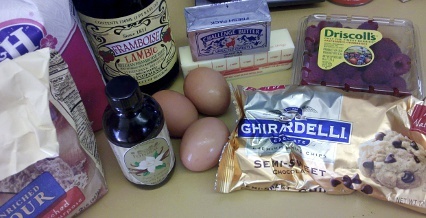 Once the chocolate has been incorporated, add the lambic. 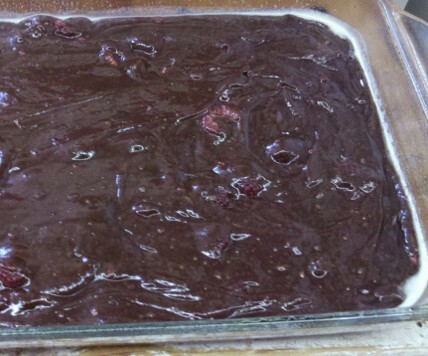 This will give your batter a reddish tint. Stir in the flour. Fold in the raspberries. Pour into your prepared dish and bake for about 30 minutes. I kept an eye on my batter and found that after 30 minutes the brownie didn't really set. In order not to burn it, I turned off the heat on the oven and let it continue to sit in there. I checked it every few minutes until I was satisfied with the consistency. 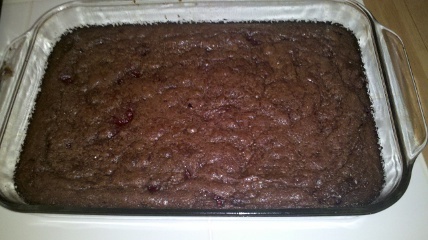 The result was a perfectly gooey brownie.